Last month my dehydrated raw eggs passed the bake and taste test with flying colors. 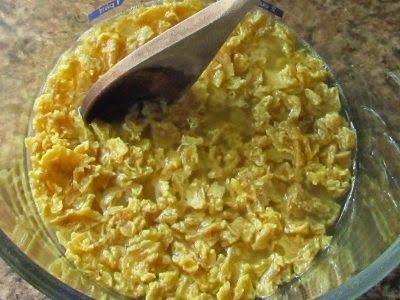 Recently I needed something for lunch and decided to try the dried scrambled eggs. Most folks powder them after they're dry, but I was curious about leaving the pieces in small chunks. I soaked them in boiling water, about two parts water to one part dehydrated eggs. Then I let them sit to rehydrate. They sat and they sat but they never did completely soak up the water. 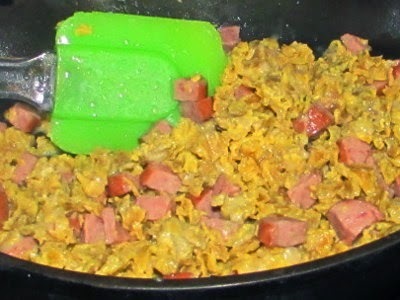 It was time to eat so I browned some smoked sausage in a cast iron skillet and added the eggs. They looked good and the taste was good, but the texture was rubbery, well, chewy, if you can imagine that for scrambled eggs. Dan's and my conclusion was that it would indeed be better to powder the eggs after dehydrating. Even at that I'm glad I gave this experiment a try. Sometimes it helps to understand the reasoning behind doing things, and texture is a good reason. Next time? I'll powder them in the blender and try again. Great experiment. I've been waiting for this one ! I think I need to get some sort of dehydrator going as I like the idea of preserves that don't rely on freezers. I've never been much on dehydrating except mushrooms and jerky! I enjoy your experiments! It was a good idea. Maybe the rehydrated eggs would have made good sandwich filling. I buy the dehydrated eggs in number ten cans and they make good omelets with lots of onions and sausage, and peppers. Gill, I have to agree about not using a freezer for everything. One of my goals is to cut down on electricity for food storage, although the dehydrator is electric! Harry, are the dehydrated eggs you get powdered? I seem to recall that the can I had was and worked very well. I think the recommendation to powder them a good one. Dani, how funny! Yes, I do have some of the powdered raw eggs left and I think your idea to experiment with those a good one. If that works, then it may be easier to simply dry and powder only raw eggs and forget about precooking. I've taken powdered dehydrated eggs camping before to eat at breakfast and you can still tell they are dehydrated and not fresh. The taste is different and isn't bad, just different. I'm not sure if I can describe it any better than that. But like you, I've found they work just great in mixes for other things. Without experimentation, where would we be? Good info! I've been waiting to see how that one came out, too. It still sounds like a worthwhile thing to do in preparation for 'molting season'. I need to find a better home for our dehydrator before I get started on it, though. It's a bit noisy for the kitchen since both De and I wear hearing aids. The blowing fan starts take on the tone of a rushing wind after awhile. Great experiment! You don't know how the eggs will taste until you try them with the sausage. You tried :-) and that's how we learn. We bought a 14 acre farm about six months ago. Wow is there a lot to get used to. Certainly not the "city life" I grew up with. I've been thinking all along about trying to preserve the eggs so I can still have some during the winter. We bought our chicks in August so we haven't had any eggs yet. I like the idea of dehydrating raw and then turning it into powder. I love my dehydrator. I did tomato powder and my own cayenne powder this summer. Awesome! I will be referring back to this post when we start getting eggs. Thanx for this post. Nancy, well, the dyhydrator does seem to retain a bit of smell but not for long and it never imparts to the next batch. I usually wipe mine out with a damp rag in between batches. I have dried onions and they are great to have around! Garlic too. Ed, I've never thought the commercially dried ones very good. Preservatives, perhaps? Camping is a great way to use them. Dried foods are so much easier to pack in that other things. Mark, thanks! Yes, I usually don't dehydrate in the kitchen either, but moreso because of the heat it generates. My back porch is my dehydrating place of choice! Sandy, thanks! I've finally learned to call everything an experiment the first time I try it. There' always something to tweak afterwards! Karen, welcome and congratulations on your farm! I have to agree it's a totally different way of living. Sounds like you'll be getting eggs soon, hopefully plenty so you can try dehydrating. I love having them available. I've not tried tomato powder but I really need to.